There're tons of benefits of physical fitness and reasons to get in shape! A lot of strength training and exercise ideas out there are complicated, and I provide some simple information on what fitness is, its benefits, and how what you can do to be healthier. Jazzed about exercise and strength? Know what you want to get out of your training? Share it below to motivate other people just starting! There are tons of reasons to workout - some true and some not-so-much. Here's a list of some of the real benefits of physical fitness and strength training, as well as tips for getting the most out of each aspect. 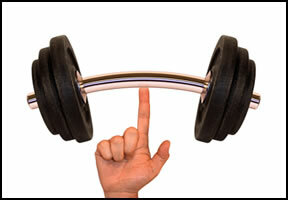 Resistance training does a great job of increasing your bone density. The strain that it puts on your body helps build bigger, stronger bones. To check out which exercises are the best for increasing bone density, and how the exercise actually increases your bone density, check out that link. tons of great info, as well as a list of exercises you can immediately start doing! If you want to get just generally healthier, there's not much that's cheaper, easier, more fun, or more effective than exercise. There are tons of benefits of physical fitness! Check out the top 7 ways that exercise improves your health. It's obvious, but that doesn't make it any less true. Getting stronger is probably one of the most important aspects of strength training. Check out this article to find out the foundation aspects of strength training. Which are actually quite simple and straightforward. There is a big, positive connection between mental health and exercise! You form a positive self-image, feel better, get better sleep, etc., etc., etc. There are tons of reasons the mental benefits of exercise are just as important as the overt physical benefits. This article outlines what mental benefits you gain, why you gain them, and what sort of exercises help you gain the most benefits. Also, check out some fun ways to exercise. If going to the gym isn't your cup of tea, check this list of 140+ alternatives out! Different kinds of strength training put strain on your joints. This actually helps your body strengthen connective tissue in those joints. Learn what kinds of exercises you need, specifically, to develop strong joints. And how your body actually goes about strengthening your tendons, ligaments, and other connections. Exercise is great for lowering your blood pressure. Many times it's safer than taking drugs, since you avoid weird side effects, and it's way cheaper too. One of the great benefits of physical fitness is a healthier, more efficient body. Learn about the best exercises for lowering blood pressure - and learn how that exercise changes your body. The benefits of physical fitness extends to their ability to help you control your cholesterol. They raise your levels of 'good' cholesterol and drop your levels of 'bad' cholesterol. Check out what exercise to do, how much to do, and other tips to master your cholesterol. Effective, cheap, convenient - seriously, take a look. The seven best benefits of working out. If you stay in shape there's tons of health benefits - and not just looking good ;-). I try to find facts that are compelling and actually make me want to work out. Sometimes, it's not easy getting to the gym and I need a little extra oomph to get going. Basically, what is fitness? This article has tons of info about what fitness is & what it's made up of. It also has The Presidents Test, a test that allows you to compare your fitness to that of the Average American. I normally call myself fit when I just feel strong and good about my body, but if you want an objective measure then this is your ticket. There are tons of reasons to take up strength training. But, these are the top 11 benefits I've found. Finding the motivation to exercise can be tough. There are tons of other demands on your time, and it's always easier to just put it off to tomorrow. The Top 7 Fitness Resolutions: And How To Actually Keep Them! Want to keep your New Year's Resolution this year? Or create one that's actually doable? Take a look! If you like this info about the benefits of physical fitness and strength training you'll like my monthly E-Zine, Starting Strong. It keeps you updated about new pages and info added to Complete-Strength-Training.com, and includes select articles. And you'll also get the free e-book Train Smart, Eat Smart: Exercise Nutrition Hacks! Sign up below! Strength training & doing regular exercise is hard - that's the reason most people don't start it or keep doin' it. So, Keeping yourself motivated is a must! Share Your Inspirational Exercise Story! Share your inspirational story: It could be little, or it could be life changing. What attracts & excites you about exercise and strength training? Why do you workout? Entering your story is easy to do. Just type up your story; what challenges you faced, why it was hard for you, and how you overcame them! Do you have a inspirational picture to add showing your strength? Great! Click the button and find it on your computer. Then select it. Just make sure it isn't bigger than 800x600 pixels. If it isn't, just re-size it in a paint program or at Picnik. I hope this info on the benefits of physical fitness makes your training easier, and gets you motivated. Exercise tips and fitness information abound, but good info that will help you isn't easy to find. Get the info, and then run with it. Literally! • Click here to leave 'The Benefits of Physical Fitness' & go back to theComplete Strength Training Home-page.